Fantasy Character Development - help me out!! Win a free book. Stephan lurched from his bed, the screams still ringing in his ears. “I’m coming Ashona,” he shouted, trying to reassure her as be hurriedly donned his night robes. He stubbed his toe on the door separating their rooms in his eagerness to reach her, as the heavy wood swung inwards. He swore as hobbled to her side. The pain was intense, but he ignored it. Her screams were far more important. It didn’t help that the rooms were in pitch darkness. It was late, probably past midnight and he had been deep asleep when his subconscious picked up the sounds of screaming and even now his brain was partly fog filled from his own dreams. There was an air of unreality about the night. It was as though the world held its breath. He reached her side. She was still screaming and thrashing in the tangled sheets. There were no coherent words, just the terrified cry of someone in the grip of a fearful nightmare. “Hush,” he said, trying to calm her. He didn’t know what else to do. It would be forward to touch her but then her screams reached a crescendo and fearing for her he leant over, taking her in his arms. She came awake instantly. “I’ll protect you,” Stephan swore, and he meant it too. Her sobs quietened although she gripped him fiercely. He had never been held by another human being so tightly before. She was trembling and crying now. “What have I done,” Stephan moaned. For a moment longer they were silent except for her tears. “I should never have started this experiment. I should never have suggested this. This is the worse nightmare you have had. Isn’t it? He felt her relax a little. She nodded her head. He released her, letting her settle back onto the bed. “What happened?” he asked. Her voice, raw with emotion, cracked as she spoke. “I was in a cave. It was awful. They surrounded me. I couldn’t escape...” Her words were rushed and he could hear the growing panic in her voice. “Hush now,” Stephan said, holding her hand. He turned to a candle standing on a bed side table. He waved his hand, a finger drawing a rune in the air. A shape long learned by sorcerers to summon elementals. A flame elemental sprang into being at his summons and its flame spread to the candle before it disappeared in to the ether once more. Its task fulfilled. “There. You can see now. You are safe,” he said. She stared at the flame and he was shocked by her eyes. Normally so wide and trusting, screwed tight against an unseen fear. Her face was wet and gently he dried her tears with his sleeve. She wasn’t beautiful in an obvious way, but her eyes held him captivated. He could look into them all day. He brushed her hair from her face. “What is causing them though?” she wailed, clearly desperate to have them at an end. “Whose laboratory?” she asked and he sensed that she already knew. “Lothanal,” he answered her in a whisper. She looked at him, her shock engraved deep in her eyes. “But demons are not real,” she whispered back. “But that makes my dreams all the more terrifying,” she gasped. He stroked her hair. “Yes. Have you noticed the candle?” he asked and her eyes flashed to the flame. Her nod was barely perceptible. “Stephan,” she said clasping his hand more firmly. “Yes,” he answered, fearful of the intensity of her look. Her eyes and her voice implored him with an intensity that shook him. “Don’t worry. I am not going to leave you,” he said smiling. “Please,” she implored, the flickering candle light reflected from the moistness of her eyes. He nodded and then struggled for breath as she threw herself at him in a tight embrace. Lothanal’s heart lurched and he nearly stumbled. Pain lanced through his feet and a numbing cold assailed him. He gaped around at the landscape, his eyes barely believing the view. Desolation. The whole landscape was bleak. Everywhere he gazed was faintly glowing green rocks. No life, nor any signs of life. Green was the colour Lothanal associated with demons, so his destination must have been correct, but the shock of actually standing in their world was nearly too much for him. He had spied on this world and its denizens through his kara-stone before coming here. He knew it was dark and lifeless, but being here a crushing despair weighed him down and seemed to nail his feet to the ground. He felt like weeping, and for long moments he struggled to find an inner strength. The gamble would be worth it, he prayed. He must go on and face his demons. He had committed everything in coming here. The risks were huge and he was gambling it all; both his life and his soul. He was at the pinnacle of his career. He had dared what no other sorcerer had before. If he succeeded in this task he would have power unlimited. He would be a force to be reckoned with and then he would show his people, the Eldic, what true power meant. His plans were huge. He would conquer a world. He would be an emperor and people would fawn at his feet for favours. He looked around at the desolation and doubt assailed him. Where were they? Where were the demons? He pushed a rock with his toe and agony lanced through his foot, searing its way to his heart. He stifled a scream. The very contact with the ground sent shock waves through his body and touching the rock was no exception. The pain subsided and he realised that the rock was light as though all the life had been sucked from it. A world of cinders and ash. He looked up at the sky. Nothing but darkness and stars. No clouds and even the stars seemed dimmed as though seen through a fog. He glanced down at his hand and was shocked to see that the kara-stone was not there. His mind wailed in fear and a dreadful feeling scoured his guts. His lifeline home was gone. He raised his hand to his face. Something white and translucent was within his palm, almost filling it. It was his kara-stone — or at least its ghostly shadow. His fingers curled around the translucent shape as though trying to protect it. The object, ghost as it was, gave him heart for he was relying on that to find his way home. Perhaps he, too, was like the kara-stone and was not really in their world. Perhaps he was here in spirit form only. A smile tugged at his lips but failed to reach his cold grey eyes, which for the moment seemed almost as lifeless as the world around him. He had not realised that he would be afraid. That was an understatement. He was terrified. Bravely, he took a tentative step forward and again pain lanced through his leg. His mind screamed in pain. Undeterred he took more steps. He was naked and freezing. Walking failed to bring any warmth. He looked down at the shadow of his kara-stone and drew warmth from it. Warmth and hope. That was his way home and he prayed he did not lose it. He walked a few hundred yards and then something brighter up ahead caught his attention. He squinted, trying to see it better. Against the dark outline of a hill, strewn with boulders at its base, a glow emanated from a cluster of objects that he couldn’t quite fathom. As he came closer the shape resolved into three creatures and his heart leapt to his mouth. More steps and the shapes coalesced into figures. They were static so he walked closer, his pace slowing as he considered flight for the first time. What would they do with him? They could take his soul and bind it to their world permanently. The next few steps were the hardest in his life. Two were demons, that much was clear, but the third was a man and that sent shock and fear coursing through his soul. He stopped advancing, holding his breath. Had his people, the Eldric, travelled here before him? Two of the creatures were demons, there was no mistaking that. Tall, gangle creatures, long limbed, teeth and talons. One had a head akin to a wolf, but no flesh covered its gaping maw and rows of teeth seemed eager for his flesh. The other had arms like a spiders, jointed in three places and ending a vicious looking talons. The creatures did not move. He took that as an omen and took a few more paces, ignoring the pain as much as he could. He saw then the man’s eyes. They were the only thing about him that seemed alien. Blood red, with an intensity that seemed to beckon him forward. He found that he had involuntarily taken a dozen more paces. He stopped himself, no more then ten or so paces from the unlikely trio. All their eyes were red and fastened upon him with an intensity that made him shiver. He was breakfast, lunch and dinner wrapped up in one package. “Welcome,” the man offered, causing him to jump in shock. His mind was wandering and he tried to focus. “Welcome to our world.” His words seemed silk and honey. He was handsome in a way that was almost too painful to behold. He stood with his hands clasped behind his back in a manner that simply oozed confidence. It was as though Lothanal was an insect, or a worm beneath the boot of a superior being. Lothanal glanced at the other two demons. He sensed their power, but could fathom nothing about this one. He surmised he was the most powerful, being able to take the guise of a man, but he seemed a void. There was no sense of power coming from him at all. “I am here to negotiate a pact with your people,” Lothanal stated simply. He had rehearsed this speech a thousand times, but what came next was a complete and utter surprise. A voice boomed “We have seen enough.” He spun around; seeking the source of the voice, noticing the demons seemed equally alarmed. The voice was all around them and at once a blinding flash followed by deep sonorous boom followed, throwing him backwards with a force that sucked the very air from his lungs and a blow that knocked the senses from his very being. 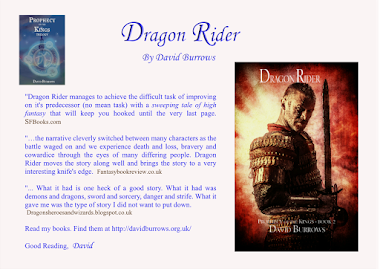 Epic, High, Traditional fantasy - which is which? 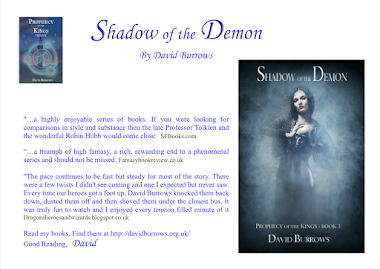 My books have been described as Epic, High and Traditional fantasy, but which is what? I wasn't even aware there were so many variations. Help me out with your views. I judge Lord of the Rings was traditional fantasy. Any takers? GPs going on strike - what on earth?? David Burrows is a self-confessed fan of J.R.R. Tolkien’s work and it is the great professor’s influence that shows clearest in this work. The combination of solid characterisation and the creation of a vastly different – but equally well formed – races help establish the setting and peoples with which he is ably to adeptly tell his story. In his free time the author engages in Saxon/Viking re-enactments and this knowledge and expertise really bears fruit in the battle scenes that are tightly choreographed with a great feeling of authenticity about them – it is just like reading about a battle from by-gone years (if you allow for the fantasy element of course). 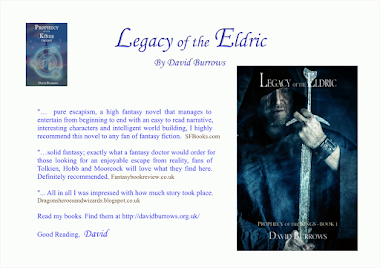 I greatly enjoyed the Legacy of the Eldric, David Burrows’s first foray into the genre, and my words at the time, “this is solid fantasy; exactly what a fantasy doctor would order for those looking for an enjoyable escape from reality… fans of Tolkien, Hobb and Moorcock will love what they find here”, holds as true for his latest work as they did for his debut. Fans of high fantasy that features an eclectic array of races, strong plot and lots of well-realised battles should look no further as Drachar’s Demons will satisfy in all areas. I greatly look forward to watching this author’s catalogue grow in the future. 7.8 out of 10. Not sure what to make of it. The CGI was very good. With this standard a remake of Lord of the Rings would be amazing. Not that we need a remake just yet. 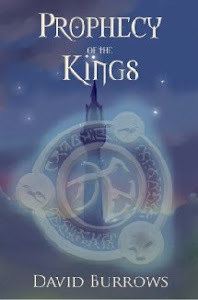 The tale was dark as expected, but it kept too much to the fairy tale to be too dark. Instead it relied on the CGI. There was a lot of familiar scenes nabbed from other tales to extend the story line. I won't spoil those parts for folks, but as a fantasy fan I was a bit disappointed. There was scope for a bit more originality. The evil characters were truly evil, or at least they shouted a lot to convey that they were baddies. After so much shouting I started to cringe when the next dark villain appeared. Of the three recent films I've seen, this one, Men in Black and Prometheus, I preferred the latter. I loved the original film for its originality. I really wanted this one to be as good but it fell short of my expectations. It's a cop film with a Sci Fi background. The originality was lost which was disappointing. It's OK but it could have been much better. Going back in time to when MIB were first formed, first alien encounters etc would have added a unique dimension. As a fan I'm glad I saw it, but it could have been so much more. The younger K was good. I loved his dead pan facade but even that could only stretch so far. Cracking film. Well worth seeing for fans of the original Alien and follow up films. It ties up some lose ends, explaining how the original space ship containing the aliens is where it is and the background to the aliens themselves. There are some surprises and it is well thought through. However, I felt that there were some discrepancies in my view, with the original film, but given the film has only just come out I'll keep quiet for now. Don't you just love Cambridge. Great place for a visit, especially when the weather is nice.